ADvantage is a web based tool that gives marketing and advertising departments the ability to streamline the production, trafficking and archival functions of ad placement using Universal Art and Design as their outsource partner for the actual ad creation. 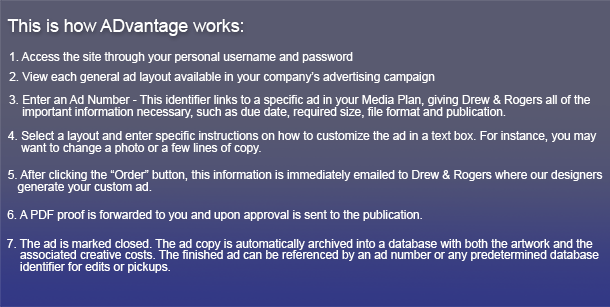 ADvantage is built around a database that will archive all transactions, thereby keeping your latest ad copy and ad status available at your fingertips. ADvantage’s database will also streamline the allocation of ad creation costs so management can track expenditures and match them against increased business activity. ADvantage has an integrated billing module that allows summary billing by cost cent, publication or whatever criteria selected.